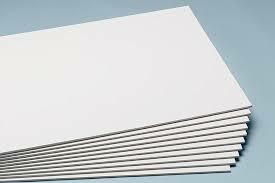 This 48"x96"x3/16" foam Board is white foam with white paper. Bainbridge Standard White Foam board is ideal for all non-archival mounting purposes. Conveniently lightweight yet sturdy enough to resist denting. Designed to facilitate clean, crisp cuts and edges. Extra-smooth surface and dual-sided with bright white surfaces. All Bainbridge foam boards are CFC-free. There are 25 sheets per box.